The Hawks needed a PG as Schroeder is on his way out. They got a very talented one with Young, who has one of the most entertaining seasons in recent years with 27pts 9as per game. He will have to adjust to the toughness and size of NBA PGs but for sure has the offensive talent to score and create for his teammates. Hawks may yet regret to pass on Bamba and Jackson Jr. Huerter brings versatility and talent at the SG spot where he will compete with Kent Bazemore. Spellman is a good player but the Hawks already have a rising PF with Collins. Drafting Robinson could have been a risk but at 30, he would have been worth it. How in hell did the first 26 teams to draft let Williams slip to the Celtics? Boston’s roster is already stacked but they managed to upgrade it with one of the best rim protector in Robert Williams. A human pogo stick, Williams complements Horford perfectly and will have a good mentor to improve his mid range game. One more steal for the Celtics. The Nets had needs at different spots and decided to draft two very similar players. Musa is talented but far from being the most efficient player. He has a lot to weakness to work on from strength to shooting consistency and lack elite athleticism. Kurucs is more of a shooter but not an elite one and lacks that major skill to be a NBA player. They could have used their first pick to draft a much needed PF like Spellman who was still available while there were better prospects than Kurucs at the wing spot like Mykhailiuk, Bates Diop or Alize Johnson. Miles Bridges, albeit being an atypical player, brings toughness and versatility. He can shoot, rebound, block shots and will give 150% on the court. Graham is a solid back up PG. With all the rumors about Walker’s trade, the Hornets would would have been better advised to draft Gilgeous Alexander, who would have been perfect with UK alumni Malik Monk. Kubolka is limited by his athleticism and lack of versatility but getting him this late in the draft is not too much of a risk. Carter is exactly what the Bulls need to overcome Markannen’s lack of strength and defense inside. He is a talented glue guy who will get rebounds, set screens and be that rim protector the Bulls can use tost the tone in defense. As expected, the Bulls had promised Hutchinson he would be a first rounder. He may be a reach as similar skilled wingmen like Frazier or Bates Diop were still available in the early second round. Cleveland was expected to draft Sexton. I wish him the best but he lacks a consistent shot and basketball IQ for the moment. If the Cavs wanted to draft a PG, Gilgeous Alexander would have been a better choice due to his passing ability, defense and versatility. Michael Porter was also there even if there is a lot of speculation about his health. It’s very hard to criticize Dallas for drafting Doncic, maybe the best European prospect for 30 years but as the saying goes, you can’t teach size. Doncic has incredible basketball IQ and a solid body, yet does he have the athleticism to perform as well as he did in Europe? Jackson Jr and Bamba could be franchise players in the years to come and bring that rim protection that a outside player, above all someone like Doncic, will never bring. Brunson is a steal at 33rd and will be the perfect back up to Dennis Smith Jr as a less athletic but more poised PG. Spalding and Antetokounmpo have very intriguing profiles, the latter possessing maybe the biggest upside of the second round (with Mitchell Robinson) and a solid family structure to reach his potential. Nobody knows if Porter Jr will be the next Oden or the next Durant. 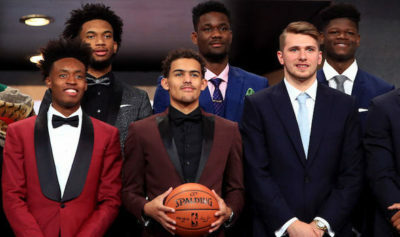 Whatever happens, with the 13th pick, Porter Jr has too much upside to pass on him. One of the only players with superstar potential, Porter Jr slipped due to his medical record. If he can stay 5/8 years in the League without any serious injury, he could become of the biggest steal ever. Same goes with Vanderbilt who was a top 5 high school player a year ago. Limited in playing time due to injuries, Vanderbilt was one of the best rebounders when he played with 7rbds in 17min. Welsh is a solid back up at C even if he wasn’t expected to be drafted. Thomas was projected in the 18-28 range so getting him at 38 is a major accomplishment. One of the best two way players of this draft, Thomas is a unique defender who can also score in bunches. With their second pick, Detroit selected another SG while efficient SFs like Bates Diop or Johnson were available. Evans is your prototypical 3 and D swingman but his junior season was a setback compared to what he showed last year in term of shooting efficiency. Other 3 and D like Frazier were available. Maybe the Warriors should have gone with an inside player like the sweet shooting PF from Nova Spellman or the high risk high reward Mitchell Robinson. The Rockets had only one second pick which they used to draft Melton. The former USC kid hasn’t played this season so it’s hard to valuate how much he has improved. Maybe the Rockets know it better and have seen in Melton someone who can contribute from the bench at both backcourt spots. Edwards is a solid shooter from the wing who can finish inside. Holiday was a fast riser in the last days before the draft. He will learn behind Collison, another alumni from UCLA with the same profile. Spellman and Robinson could have been good picks for the pacers who already have a back up PG with Cory Joseph. Alize Johnson has been underrated the whole process despite good performance at the combine but it’s not sure that he will have playing time to show what he can do. As much as I appreciate Gilgeous Alexander, who fits perfectly in the backcourt with Lou Williams, I don’t understand why the Clippers selected a SG with Williams, Wallace and Rivers already on their roster. Above all, there were major prospects available like Robert Williams (if Jordan leaves) and the potential steal of this draft Michael Porter Jr. We’ll see how much playing time Robinson can get there and how the aformentioned prospects will perform. Another pick I don’t understand. Why pick Wagner, a limited rebounder and defender when the more solid Spellman or the high risk high reward Robinson are still available? Wagner is a good player but has limited upside and will never be anywhere near his fellow countryman Nowitzki in term of production. They went all Deutsch with Bonga, a potential draft and stash pick who, despite his interesting physical profile, has a lot of weaknesses to fix. At 47, Mykhailiuk is a solid pick who will bring shooting and rebounding from the wing and was expected higher. Two very solid picks for the Grizzlies. Jackson Jr is a polarizing prospect. Some have concerns about his consistency and motor but he was efficient in limited playing time, combines rim protection and shooting ability and has one of the highest upside of this year’s class. Carter is a pesky defender who will bring toughness from the bench. The Final Four MVP has been a late riser after the NCAA Tournament. With Lonnie Walker available, drafting DiVincenzo at 17 is a reach. Above all, the Bucks had the opportunity to draft a high upside rim protector with Robert Williams or Mitchell Robinson. Okogie has athleticism and length but needs to improve his basketball IQ and doesn’t really fill a need for the Wolves. Spellman or Robert Williams could have been better picks to help KAT inside and learn behind the aging Gibson. Bates Diop seems a better pick at 48 as the Buckeye can play both forward spots and was expected much higher. A talented PG, Carr had a tremendous season where he led Penn State to the NIT title. A consistent outside shooter and passe, Carr slipped due to his lack of athleticism and poor finishing at the rim. Yet, his size and offensive talent at the PG could allow him to see the court with the Pels. Knox’s size and versaility is intriguing. Yet, he still has a lot of things to work on from his hooting consistency, defense to his ball handling. Some experts prefer the more ready Mikal Bridges but don’t forget Knox is three years younger so let’s wait and see. Mitchell Robinson at 35 isn’t a risk. If it doesn’t work, too bad. But if it somehow works, the Knicks have a physical freak who will form an incredible pair with Porzingis. The main question is how the pretty immature Robinson from tiny Chalmette, Louisiana will handle NYC crazy life. The Thunder got Diallo in an upcoming trade. The Kentucky aluni was once considered a first round pick and has tremendous physical gifts, it’s up to the OKC staff to bring him back on the right track. Devon Hall is a solid shooter and team player but wasn’t projected in the second round while both Arizona guards Alonzo Trier and Rawle Alkins were available. Kevin Hervey had a good showing at the combine but shot just 33% from three during the season. If the Thunder need a PF, they should have gone with Penava, NCAA best shot blocker and a better shooter than Hervey. With the 6th pick, Orlando gets the player with the biggest upside. Bamba had a good year where he showcased his rim protection and rebounding. Yet he was criticized for a lack of motor and often falsely compared to Rudy Gobert (who hasn’t scored a three in five years). He answere with very good workout where he worked on his mid range game and three point consistency. Orlando may play him at the five but they may also try him at the four alongside the more polished Vucevic. Frazier is another player who measured well at the combine. An athletic swingman with a 7-1 wingspan, he could be a good complement to Fournier and Gordon. Justin Jackson is not sure to see the court due to the logjam at the forward position but don’t forget he was one considered a top 10 player in his class. The process goes well, thank you. After trading local hero Mikal Bridges, the Sixers trade him to Phoenix for the more adequate Zhaire Smith and a 2021 first round pick. Smith bring that toughness, athleticism and defense that Reddick doesn’t possess. He may improve his shooting if the fmer Dukie stays in Philly. As one of the younger prospects in this draft, Smith is helluva pick for Philly. Landry Shamet is another solid pick whose size complement well McConnell’s toughness. With two late second round picks, Philly trade up for another combo with Shake Milton. He has a bit the same profile as Shamet. Maybe Pilly should have kept Spalding and Antetokounmpo to challenge Saric at the four or draft Penava. After some disappointing picks in the last drafts (Chriss, Bender, Jackson), Phoenix may have secured a playoff spot for the ten years to come, and not only because of Ayton. Let’s start with DeAndre, the best prospect of this draft, a nightmare for his defender with size, athleticism and talent. Phoenix traded up to catch another jewel Mikal Bridges. The Villanova swingman has 3 and D potential and knows about winning. He may force the Suns to trade Warren or Jackson. They kept winning by drafting Frenchman Okobo with the 31st pick. Okobo had an important year playing full time at the PG spot and finished strong with a 44pts outing in the French playoffs. George King is a strong combo forward who can shoot but probably won’t make the team. Portland’s backcourt lacks some size so who did the Blazers draft? Another undersized guard. Simons has a lot of upside, but he’s not a combo for the moment and he may need time to adjust to the League. In another questionable move, Portland draft a second guard with Gary Trent Jr. The Blue Devil is a very good pick at 37, but the Blzers could have picked Spellman, Williams or Frazier who were more needed than a guard. A solid, safe pick, Bagley will bring the offensive threat and rebounding the Kings lack at the PF spot. Today, it can seem the best choice, but how will Jaren Jackson jr and Bamba develop in the years to come, will they become better than Bagley? The Spurs now have formed their backcourt of the future with Lonnie Walker, a high upside pick who could have a better freshman year. His length and athleticism could help him overachieve in the League. Metu at 49 is a solid pick. Projected in the early second, his size and athleticism will be useful for the Spurs. The Jazz usually are a good drafting team but Grayson Allen at 21 is a big reach. We’ll see how they will use the Dukie but the Jazz had other needs, notably at the PF spot with Spellman still available. If they think Allen can play the PG spot, Holiday, Shamet or Okobo were available too as passers who can shoot. As talented as the do it all swingman from Oregon is, is he the player the Wizards need? Washington’s starting five is set but Gortat is aging and Robert Williams could have brought immediate contribution in defense and rebounding while being mentored by the Polish hammer. Brown will come from the bench at the three outside spots. didn’t charlotte draft a Euro?